That picture-perfect autumn. Can’t you just see it? Picking apples on a crisp September day. Cozy nights in front of a crackling fire, sipping hot cider. Octobers bursting with ruby, gold, and amber. A spooky Halloween night where your breath shows on the chilly air. We know just what you’re looking for, and we know exactly where to find it: New England. Of all places on earth, fall in New England may be the very best. It’s a region totally MADE for this season, and every fall activity you could dream of can be found here, with a backdrop of brilliant foliage and quaint little towns. As you plan your autumn travels, we think New England MUST be on your list. And if you’re going to visit, you should choose the very best spots. Here are 8 amazing destinations to take in the New England fall festivities. The leaves tend to be their brightest and boldest in early October, but may change slightly according to conditions each year. 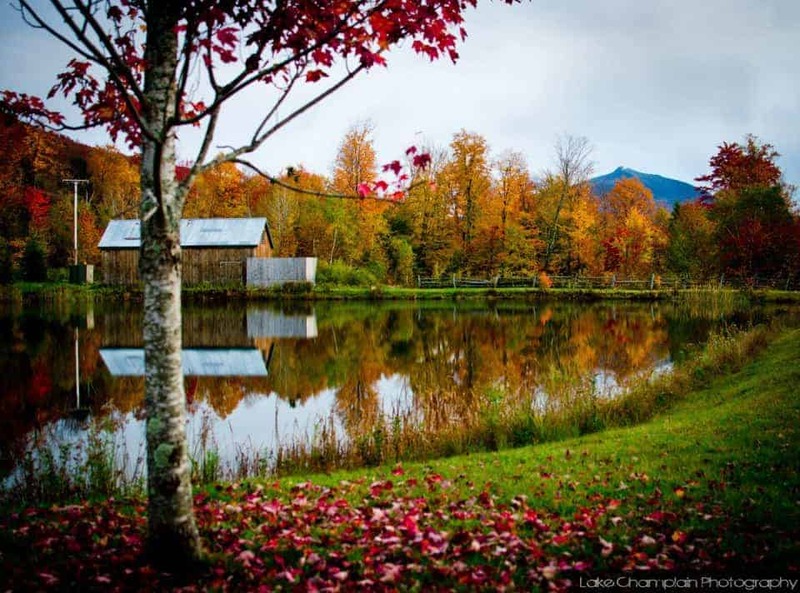 Stowe, Vermont is one of the best places to go in New England in October. 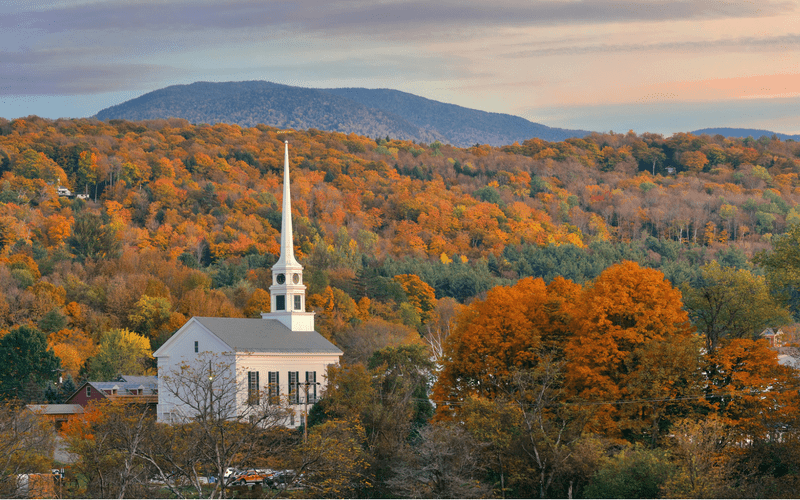 With its white-steepled church, the village of Stowe presents the perfect fall photo opportunity. While this is a popular winter destination due to its nearby skiing and other winter activities, Stowe is equally resplendent in fall. Many come here to hike or to enjoy cycling, shopping, and art. It’s also a good place for foodies, with delicious restaurants in Stowe and nearby Waterbury. For the best fall delicacies, stop at the Cold Hollow Cider Mill for fresh pressed cider and to-die-for apple cider doughnuts. Fall foliage hike options in Stowe: Moss Glen Falls, Stowe Pinnacle Trail (great views! ), or Sterling Pond. The most northerly option on this list, Acadia National Park is a fall destination that offers wilderness and adventure. This 47,000-acre national park is set on the coast of Maine, nearly to Canada, and is a perfect spot for outdoor lovers to experience a New England autumn. There are countless options for hiking and camping. Many hikes offer incredible views of oceanside cliffs and inlets. Breathtaking scenery isn’t the only great thing about the area, either. The cozy town of Bar Harbor offers dining, shopping, and culture, so you can enjoy the best of both worlds. After roughing it, spend the night in a warm Bar Harbor B&B. Bar Harbor has some great restaurants whose chefs love using the local, seasonal flavors. A fall-inspired meal on coastal Maine sounds amazing. You can also head out on the water for a scenic cruise, and of course don’t miss the lighthouse. Acadia National Park and Bar Harbor are likely to be less crowded in September and October coming off of the busier summer season, so take advantage. Remember, it will start to grow quite chilly here by the end of September–a good thing to keep in mind if you hope to go camping. Mid-October is generally forecast to be peak foliage, but follow local reports for the most accurate info. Salem is rich with history, and you’ll be kept busy by museums, exhibits, and notable sites. Real history buffs might want to read up on the witch trials before visiting, as this will help you better understand the town’s dark moment of the past. If the spiritual interests you, Salem is home to many modern-day witches and spiritualists and you can sign up for a palm reading, tarot session, or other experience. 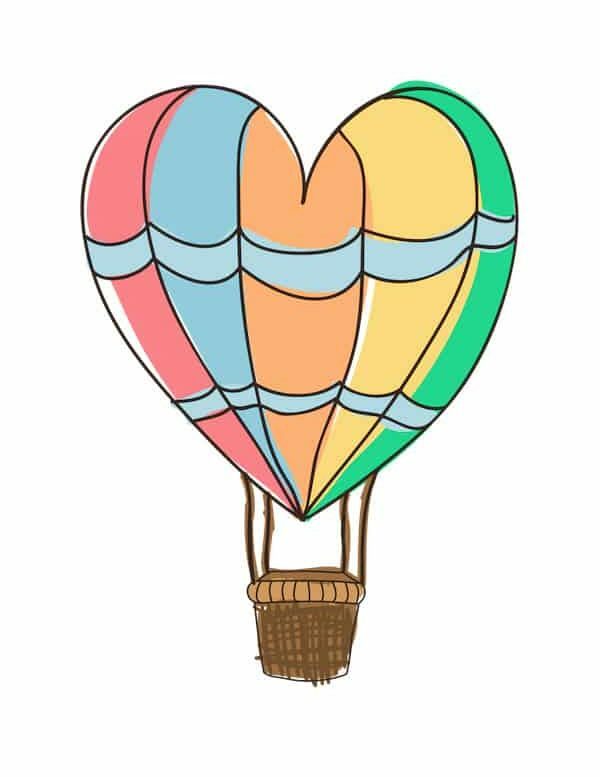 Or simply browse the shops and peruse the magical goods. In Salem, fall is definitely in the air. It’s a beautiful and picturesque destination that is great for shopping, dining, and walking. Its proximity to Boston makes it an easy getaway, too. With its position on the coast, Salem is more likely to experience peak foliage in mid to late October. New Hampshire is another great state to visit in New England in the autumn. The rugged White Mountains will be aflame with color and make for spectacular hiking and leaf-peeping. 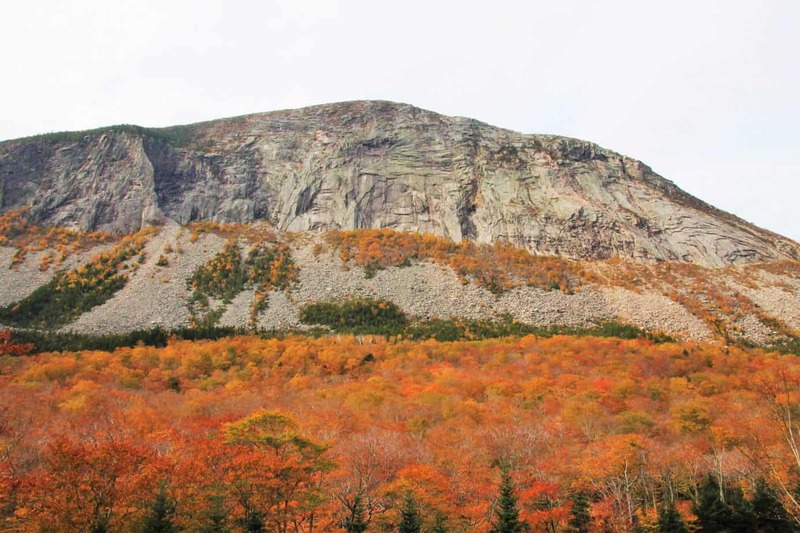 Is New Hampshire on your list of New England fall destinations? It should be! New Hampshire has many choice spots for foliage, like classic-looking towns such as Sugar Hill or Jackson, or more tourist-centric places such as North Conway and Lincoln. Early October is when this outdoor paradise tends to reach peak foliage, and it’s definitely worth planning ahead to catch the peaks decked out in autumnal hues. For an extra fun fall excursion, drive the famous Kancamagus Highway, a scenic stretch of road that runs 34 miles through the White Mountain National Forest. It is bookended by Lincoln and Conway, so you’ll get the chance to stop in two top destinations during your drive. New Hampshire also is notably beautiful in wintertime! Providence is the biggest city on our list of New England fall getaways There’s a lot going on in this city year-round and fall is no different. 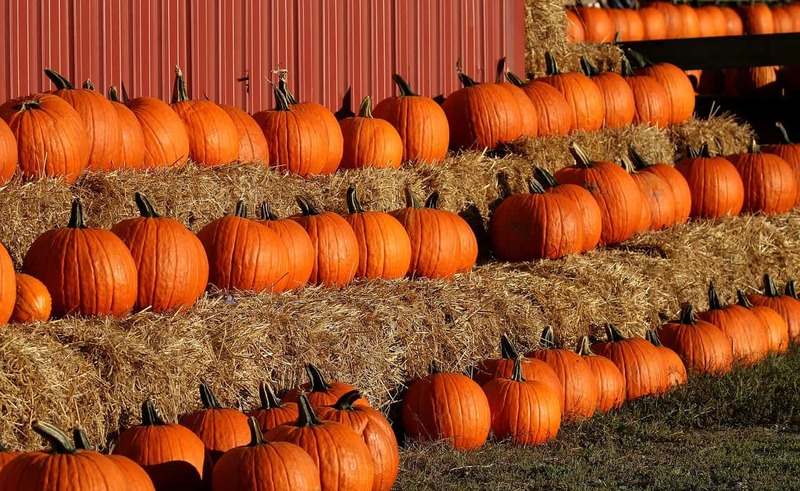 A short drive from Providence you’ll be able to take in typical fall activities such as corn mazes and pumpkin patches. You can count on events like Oktoberfest or other fall festivals, too, both in Providence and nearby Newport. There’s something very cozy and autumnal about a city. Providence boasts some interesting older architecture and impressive homes. With the addition of fall foliage, these take on an imposing look. Horror fans may know that author H.P Lovecraft lived most of his life in his hometown of Providence. You can explore significant Lovecraft sites such as his home and his grave, as well as sites which figure into his works of horror fiction. There’s no better time than autumn for such things! Woodstock is classic New England, with covered bridges, rolling farmland, and a tidy Main Street. This is a destination that is lovely in summer, picturesque in winter, and stunning in autumn. It’s probably not too bad in spring, either! If you’re looking for a small village to hideaway for a fall weekend in New England, Woodstock is an excellent choice. Your main activity is likely to be leaf peeping, as the foliage will explode in late September and early October. You can also dine on cheese, apples, and other Vermont fare, with lots of autumn specialties available at the many great local restaurants. Antiquing is also a great fall activity here, with many roadside shops stocked with eccentricities and treasures. Be sure to stop by the Quechee Gorge overlook, to have a look at the gorge in its autumn splendor. PS: Check out Manchester, Vermont as another alternative slightly further south. Connecticut is the most southerly of the New England states, but it, too, enjoys glorious fall foliage. And in fact, CT claims to have the longest foliage season of all six states, giving you plenty of time to come for a visit. The Litchfield Hills are a highly recommended spot for fall in Connecticut. Covered bridges, small villages, and sparkling lakes await you in this area. Many choose to drive the Litchfield Hills Ramble, a route that circles 100 miles from Torrington through Litchfield and brings passengers past lush foliage. Here is where classic farms are bordered by stone walls, covered with fallen golden leaves. Hidden waterfalls are to be found within the woods, trimmed in color. It is best to do this road trip in late September and early October. Don’t miss the town of Kent, called one of the finest towns for foliage in all of New England. Hiking, kayaking, fishing and antiquing are popular activities in the hills, but it has also recently become something of a foodie destination, so bring your appetite. In Western Massachusetts, you’ll find the Berkshires, a place which bears some similarities to the Litchfield Hills, and abounds in art and culture. There are opportunities for picking fresh apples, plus a wide array of harvest festivals and fall celebrations. Fall seems to be beloved by Berkshires residents and visitors. Hiking is popular here, where the peaks never seem too high, and it’s only a short walk to capture breathtaking scenes. The foliage routes are also home to antique stores and other small shops, where you can stop and search for trinkets. Gorgeous homes are also a lovely site; in particular is the stately town of Lenox. Why not climb aboard for a horse-drawn carriage ride? It seems relics of amazing history abound throughout the Berkshire region—in every season, but especially in fall. Not sure where you want to go? Consider taking one of these New England fall foliage tours! 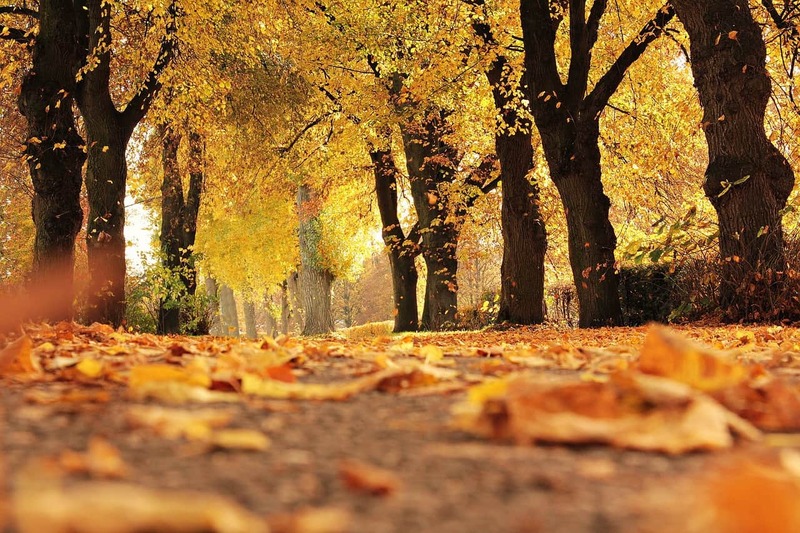 What is your favorite fall destination? Have you been to New England? I’m still grasping onto summer (it’s my favorite, and this summer has been so lovely in PA), but now I want to go home to Maine for fall! I haven’t been in Maine in the fall for SO long–usually my trips are in the summer or for Thanksgiving or Christmas. 🙂 I don’t think it’s going to happen this year…but maybe next! us too! thanks for letting us feature your gorgeous pic. We should hike together sometime!! Awesome post guys, we are seeing more & more beautiful fall pics of New England that are making us want to visit! We’ve got a lot planned next year travel wise but definitely want to fit some US travel in at some point! Love the look of Stowe with those churches & crisp trees all around & we love hiking too! yes!! Isn’t Stowe stunning? We’re going there this weekend! Weeee! oooh VA does rock the foliage as well! Yes, come visit our way some time! Oh man. My head just exploded after seeing all that color. Such a beautiful collection of places to see in New England. I’m jealous of you folks who actually get to live there! Thanks for sharing this, Amy. I now have a pretty epic list of places to see for fall! The fall colors and scenery in this “leaf peeping” story make us want to feel the crunch of leaves under our feet in New England :-). Looking to go to New England for first time this fall. Would love direction and ideas.